A rich dark amber barleywine brewed in extremely limited quantities. 1100 bottles produced in 2010, brewed in August, released in December. It has previously been brewed in 2001. 7 / 3 / 7 / 3 / 14 35 341ml bottle @ Syringa Creek Provincial Park. 2012 Vintage. Pours an opaque yet cloudy brown colour with a small beige head. Nose is sweet caramel malt, dark fruits with bread notes and signs of oxidation. 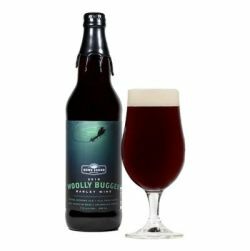 Flavour is sweet caramel, roasted malt, boozey, fruitcake, and a slight oxidized character. Medium bodied, decent carbonation, sweet, and a warming alcohol finish. 7 / 3 / 7 / 3 / 15 36 375ml bottle @ Syringa Creek Provincial Park. 2014 Vintage and cellared 4 years. Pours an opaque yet cloudy brown colour with a small beige head. Nose is sweet caramel malt and dark fruits with bread notes. Flavour is sweet caramel, roasted malt, dark fruit, and a bread character. Full bodied, soft carbonation, sweet, lightly oily, and a warming alcohol finish. 375ml bottle from the Bainbridge LRS. Vintage 2014. Pours an opaque dirty brown with a beige head. Aroma is sweet with dark fruits and caramel notes. Similar taste, maybe with some oxidation. Fairly dry aftertaste with some bready notes and noticeable hoppy bitterness and candy notes. Good and fairly complex stuff. I wish the barrel aged version of this would be available. Pours a large frothy beige head. Has a dark amber appearance. Thick lacing. Aromas of nutty and sweet malts, light caramel malt notes. Some spices and resin hops. Has sweet flavours, caramel, toffee and roasted malts. Alcohol is slightly noticeable. Warming sensation on the palate. Nice and smooth, easy drinking barleywine. Bottle shared at Ratebeer awards show. 30/01/2016. .Many thanks! A hazed orange brown coloured pour with no head. Aroma is tangy red berries, woody malts, grapey, hot alcohol. Flavour is composed of nice cakey malts, toffee, red berries, wood. Palate is sweet and sticky, moderate carbonation. One of the best beers I’ve ever had. Heavy pour gives enough force to bring out two fingers of white foam on top of amber. Toffee, biscuit, dark fruit, and some citrus arise with alcohol heat permeating throughout. Taste is subdued bittersweet, but after each swallow, a rush of dark roasted warmth fills your nose. Lower carbonation forces you to get up close and personal to appreciate the aromas as you sip. Mouthfeel starts slick but ends clean and pleasantly warm. Finishes dry and intoxicating! Bottle shared at RBWG: Poured a brown with a tan colored head. Aroma is weird mix of malts and spice. Taste is malty with candy sugar and sticky on the tongue. 2011 edition. A murky dark amber ale with a thin off white head. In aroma, sweet dark fruity malt with loads of vinous notes, treacle, dark fruits, molasses, light oxidation, alcohol warmth, very nice. In mouth, a nice sweet fruity malt with light vinous notes, treacle, light butterscotch, alcohol warmth, nice and smooth. Bottle split at RB Best bottle share, 30/01/16. Hazed chestnut brown with a decent tan head. Nose is dark fruits, toffee, dates, spice, light plastic. Taste comprises bitter fruit, no plastic notes, sticky toffee pudding, biscuit, rich malt. Full bodied, fine carbonation, semi drying close. Ok barley wine. 2013 bottle. Deep amber color with a thin beige head that quickly dissipated. Rich sweet burnt sugar and ripe fruit nose. This is a very sweet barley wine. Lots of brown sugar, alcohol, candied apricot, overripe fruit, and more alcohol. Fairly simple, sweet barley wine.